Sardinia takes you to golden sandy beaches and glamorous towns on one of Italy’s most popular Mediterranean islands. It offers cultural influences from fascinating Mediterranean cultures which perfectly blend with its laid back atmosphere to make this the ideal spot for a relaxing holiday. Couples will love the colourful Venetian houses and little fishing villages which can be found dotted along the coastline, while families will enjoy beaches and lots of activities. When it comes to exploring, there are forested mountains and Bronze Age ruins just waiting to be discovered. There is a fantastic selection of towns to choose from in Sardinia. Palau is a lively port town where you can wander through pretty streets, ducking into boutiques, restaurants, and friendly bars along the way. It’s also perfect for those wanting to book boat trips and explore nearby. Chia is on the south coast and has some of the island’s best beaches, which are lapped by crystal clear waters. Holidays in Sardinia take you to some wonderful towns and some of Italy’s best beaches. Forte Village is the place to go for white sands and long swathes of beach backed by luscious green forests, which wind up the mountains. For a chance to immerse yourself in the island’s local culture head to Santa Teresa Gallura. Here you’ll find colourful buildings which house restaurants, cafés, and local bars, as well as boutiques selling handicrafts. 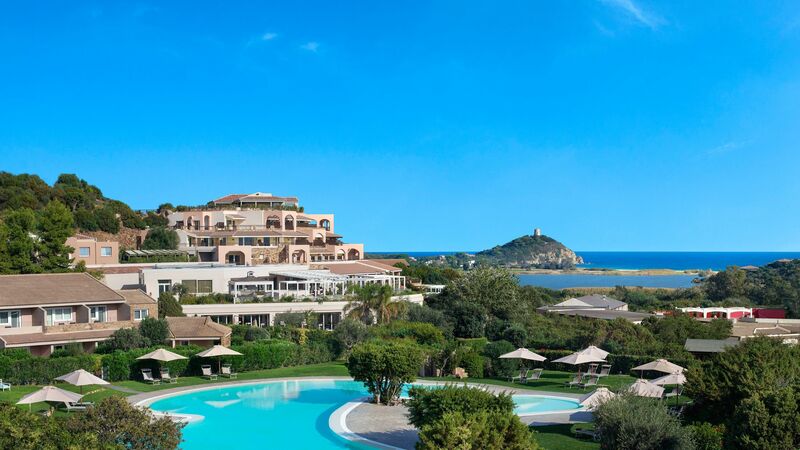 When it comes to choosing the right hotel for your luxury holiday in Sardinia, book with Sovereign and we’ll help you find the best options. We’ve carefully selected some of Sardinia’s best properties, with your needs in mind. Stay at the Chia Laguna Resort for modern amenities and spectacular views. 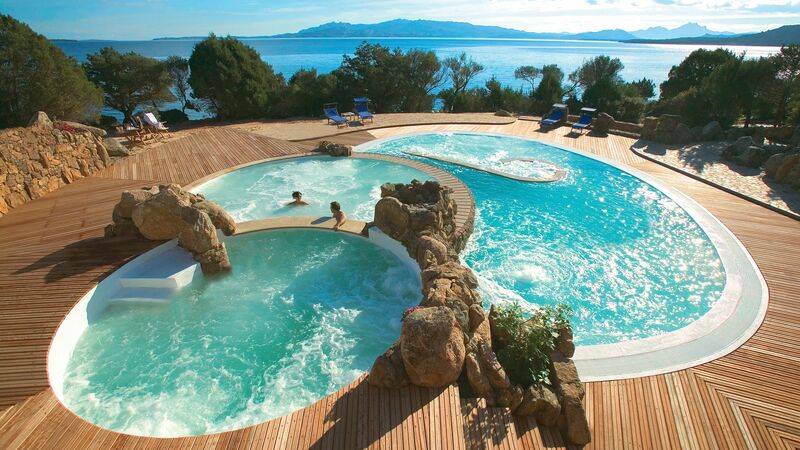 If it’s a relaxing couples’ retreat you’re looking for, Capo D'Orso Thalasso & Spa is the ideal choice. The southern village of Chia is for beach connoisseurs, thanks to a coastline that’s a smorgasbord of dune-backed sands, rocky coves, tower-topped headlands and seaside lagoons. 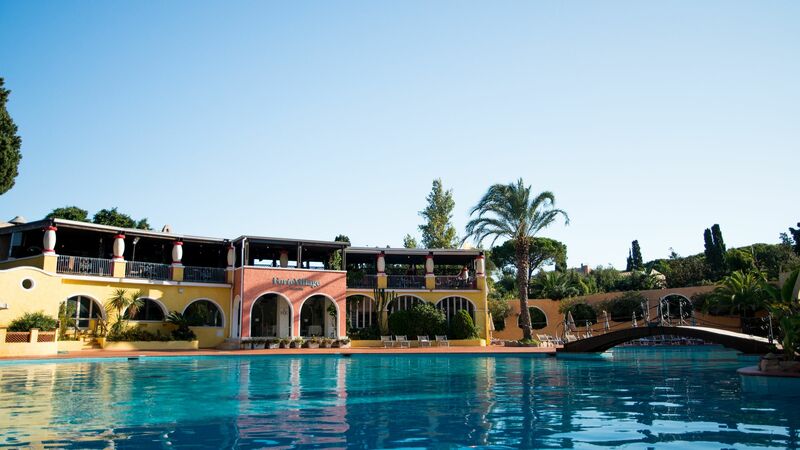 The Forte Village Resort doesn’t do things by halves. It stars luxe villas, nine pools, a thalassotherapy spa, family-friendly academies, a go-kart track – and a beachside restaurant by Gordon Ramsay. The seaside town of Palau burrows into the craggy far north of Sardinia, where dramatic coves, quirky rock formations, and the wild Maddalena Archipelago sculpt the coastline. Santa Teresa Gallura is a bite-sized seaside town with a deep port on one side and a craggy coastline of beaches and headlands on the other. A large island off the coast of Italy, Sardinia offers the best of Italian culture with a laid back, island twist. Enjoy the soft sandy beaches with plenty of opportunities to get little ones swimming or making the most of the water sports and activities on offer. The Maddalena islands are scattered off the north-western coast and are only accessible by boat. This photo-perfect archipelago is made up of seven ‘big name’ islands, plus a handful of smaller ones. The islands boast some of the most gorgeous scenery in Sardinia – with plenty of boat trips available, they make a great day out. Porto Cervo, on the Costa Smeralda, is a people-watcher's paradise. The resort's luxury marina and yacht club, coupled with its designer boutiques and chic restaurants, makes it a favourite with the jet set. Don a pair of sunglasses and spend an afternoon sipping cocktails and spotting celebrities. The town of Nora is thought to have been the first settlement in Sardinia - some believe it was founded by the Phoenicians between the 8th and 9th centuries BC, while others think it dates back even further, to Nuragic times. Nowadays, you can see remains of ancient Roman temples, villas, baths and cobbled streets, as well as a theatre. A drive along the coast road will lead you past dozens of beautiful white-sand beaches. Pick your favourite, park up and spend a morning or afternoon sunbathing and swimming. If you’re a watersports fan, Su Giudeu beach near Chia will be up your street – it’s renowned for its whiter than white sands and the clear waters are prime snorkelling territory. The south-coast town of Chia is home to one of Sardinia's most picturesque stretches of coast, which includes Baia Chia, a sweeping sandy bay. You can get a dose of history here, too - the remains of the ancient Phoenician settlement of Bithia sit next door to the beach. Santa Teresa Gallura is home to an array of beaches – the lively Rena Bianca, which hosts festivals and concerts during the summer months; two Blue Flag numbers; and a handful of quieter coves just waiting to be explored. Flight time from the UK to Sardinia is around 2 hours 30 minutes. Sardinia is a great summer destination, with temperatures reaching their highest (around 30 degrees) in July and August. Temperatures in spring and autumn typically stay in the early 20s and visitors at this time of year are generally fewer, so it’s ideal if you want to avoid the crowds and do some exploring. It’ll be no surprise that seafood also features prominently on menus in Sardinia. Expect lobster, clams, squid, anchovies – you name it, it’ll likely be on a menu. Other popular foods include bread, olives, salami and Malloreddus (local pasta made from saffron and semolina). Special occasion? Try spit-roasted suckling pig, a Sardinian favourite. Like in a lot of Italy, recipes here tend to have been passed down from generation to generation, so make sure you visit a local taverna or two to sample a few dishes.